In The Hanging God, James Matthew Wilson mines the landscape of contemporary American life for images to reflect its moral ravages. Raw in their affective power, Wilson’s narratives avoid ambiguity in matters of faith without sacrificing complexity of feeling, compassion, and self-examination. Strippers, divorcees, corporate accountants move among dumpsters, barrooms, bedfellows, beer bottles, and Excel spreadsheets, while the poet examines our confused postmodern responses to these tragicomic figures: would I ‘weep or smile’ at their worldly losses? Yet the narrator of these poems calls a sin a ‘sin’ and does not allow his readers to make excuses for our moral weaknesses. Wilson comes into his voice in this collection, often opting for a plain, but not chatty, style. His references to the classical canon throughout serve not to show off, but to place myth within the context toward which it points—the true myth of our hanging (and risen) Lord. If you read one book of poetry this year, make it The Hanging God. This is James Matthew Wilson’s first full-length book of poems, and a singularly powerful announcement it is . . . philosophy, metaphysics, theology, the American political scene viewed through the complex lenses of the classics, with allusions ranging from the ancients to the moderns . . . all woven into a complex music which has anchored itself in the long tradition of meter and rhyme. . . He is a word painter . . . with the eye of someone for whom the essential being of things—the quiddity, the inscape—leads again and again into a deeper mystery. Here is a serious poet, not yet forty, who is, I can only hope, at the beginning of a long and illustrious journey in the best and most profound tradition of Dante, Hopkins, David Jones, Auden, Eliot, and Franz Wright. In James Matthew Wilson’s newest collection of poems he continues to show his command of major themes of many ranges of contemporary experience in a style that is unusually complex, but always exact, profound and deeply insightful. In this new book, his best poems, those concerning matters of the soul, place him among the finest poets writing today. This book will undoubtedly propel Wilson into the first rank of conservative public intellectuals . . . The Vision of the Soul is a defense of Christian Platonism, which Wilson says is at the core of the Western intellectual tradition . . . Wilson's book gives a defense of the Western tradition that is breathtaking in its depth and clarity, conveyed in prose that genuinely delights with its elegance, lucidity, and splendor. I have never read a book in which content so profound takes flight with such lightness and style. It's like watching a 747 maneuver with the grace and precision of a hummingbird. Future generations of conservatives will look back to their encounter with The Vision of the Soul with the same sense of gratitude and awe that we today remember the first time we read Richard Weaver and Russell Kirk. This book is not only true and good, but also beautiful. ​In The Catholic Imagination in Modern American Poetry, poet and critic James Matthew Wilson offers a succinct summary of how Catholicism’s unified and sacramental vision of the world influenced some of the twentieth century’s most original voices. His elegant and sure-footed treatment of work of nearly 20 poets—from George Santayana’s aesthetics of ascent to Dana Gioia’s dramatic lyricism—make this is essential reading for any student of modern American poetry. 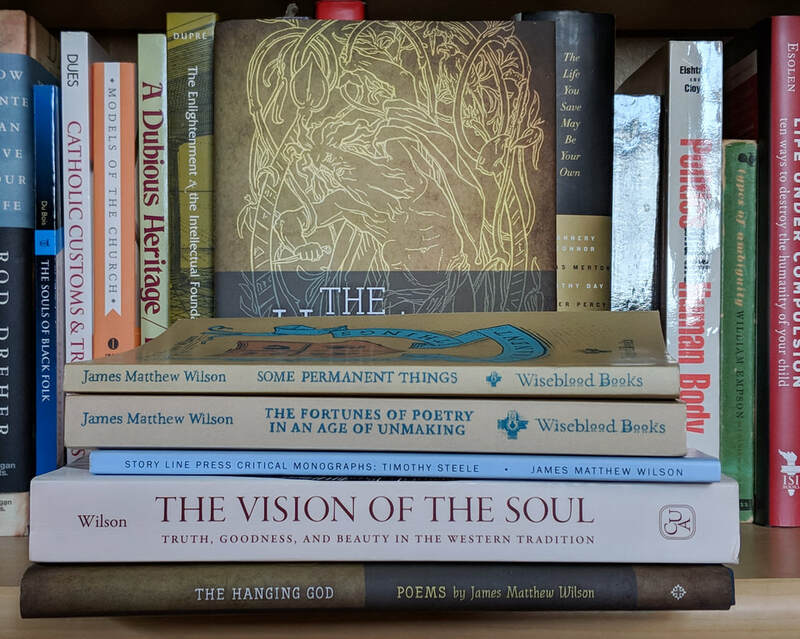 James Matthew Wilson's poems are those of a searching, philosophical, and subtle mind treating themes of the inner and outer life of our contemporary world. Understanding our human nature as inevitably "violent and abyssal," as St. Augustine wrote of infants at their mothers' breasts, he affirms that we must negotiate successfully between "discipline and desire" to build a satisfactory life. ﻿Remember the new formalists, who insisted on bringing meter and rhyme and form back into the American poetic mainstream? Well, take this first full collection [Some Permanent Things] by a poet of the generation after theirs as a solid indicator of their success. Wilson writes formal verse as if it were the air he breathes; his sonnets, sestinas, and such are as natural as his blank verse. In the versatile fluency of meter in Steele's poetry, Wilson finds evidence that meter is not an inauthentic human artifice obscuring natural realities. Rather, this versatility of meter helps establish that "the imagination is not in competition, but in harmony, with nature," a harmony so complete that it manifests "the compatibility of nature and spirit." ﻿James Matthew Wilson’s Four Verse Letters consists of four epistolary poems. Wilson addresses his father, mother, and two brothers in smooth rhyming pentameters. Although he is associated with Dana Gioia and the West Chester New Formalists, he is perhaps more of an old formalist. These poems have something of the feel of MacNeice’s Autumn Journal. Learn more about books by James Matthew Wilson or purchase them by clicking the picture below.